It’s a distinctly esoteric endeavor, generally marked by messaging pyramids, whiteboard sessions, and buzzwordy brainstorms. Nothing against these time-tested methods—we employ many of these exercises ourselves here at Tilted Chair while searching for a client’s truth. But at the end of the day, what are we really looking for? What itch are these tactics scratching at? Well, as it turns out, the foundation of a great brand is not wholly dissimilar from the pillars that support a great friendship. To the rare natural marketer, much of what follows will seem instinctual. For the rest of you, though, consider this a lesson in laying the framework for becoming a great friend and a great, human brand. Socrates—among others—famously said, “Know thyself.” It’s probably one of the most important maxims in life and branding. There’s really nothing more attractive than authenticity, and understanding who you are—your beliefs, your values, your tendencies, and your priorities—will help you gain like-minded friends and customers. You’re not going to be everything to everyone. But what can be expected of you? Are you the airport ride friend, or the football-watching companion? Are you the drinking buddy or book club pal? Setting expectations on what can be expected of a relationship with you will make it easy for your friends and customers to know when they should call you. Once you figure out who you are, what’s important to you, and what can be expected of you, don’t waiver. Your purpose should be as deeply rooted to your identity as anything else. Once you’ve set expectations, it’s up to you to meet them. Few things in a relationship are more frustrating than dealing with a friend who can’t be relied-upon to carry through on a spoken commitment. And the same can be said for brands. An incongruity between words and actions can lead to dissonance—and sometimes, the end of a relationship. 5. Listen. Don’t just wait to talk. 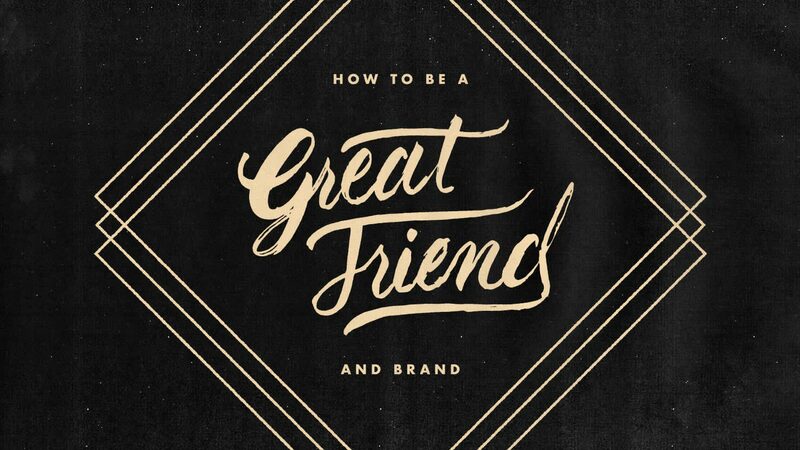 There’s a difference, and the best friends (and brands) know it. Listening is just as much an expression of priorities as speaking. You’re not perfect, and neither is your brand. You’re going to fudge up from time-to-time, and when you do, the most human thing you can do is own it, laugh about it, and move on. How many of your friends call you from a rotary dial phone? Or pick you up in a horse and buggy? Same goes for brands. Even non-tech brands have to update from time-to-time, or risk becoming disconnected. 8. Understand that it’s about the journey. You and your friends (and customers) are on a journey together, one fueled by mutually rewarding fulfillment. As long as the journey continues to be fulfilling for all parties, then the journey can continue. Be you, set expectations, be consistent, do what you say, listen, don’t take yourself too seriously, and adapt once in a while, and that journey just might last a lifetime.